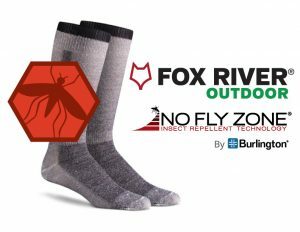 Burlington, a global diversified provider of textile solutions, is pleased to announce that it has expanded the licensing of its No Fly Zone® Insect Repellent Technology to Fox River, a leading U.S. manufacturer of outdoor, sport and lifestyle performance socks since 1900. No Fly Zone Insect Repellent Technology is a permethrin-based chemistry that helps convert apparel, uniforms or gear into long-lasting, effective and convenient insect protection. This EPA-registered technology is similar to the natural insect repellent found in certain chrysanthemum plants. It works as a contact repellent affecting the insect's nervous system causing it to fly or crawl away before a bite can occur. The U.S. Centers for Disease Control (CDC) reports an increased number of tick-borne diseases, identifying up to 16 different types. CDC recommendations for preventing tick bites include using products and pre-treated clothing that contain permethrin. In addition to protecting against ticks, No Fly Zone technology is highly effective in repelling mosquitoes, ants, chiggers, flies and midges offering protection to assist in protecting people against Zika, Malaria, Yellow Fever, Dengue Fever, Typhus, Lyme disease, Encephalitis and West Nile Virus. For more information about No Fly Zone technology and licensing opportunities visit us at burlingtonfabrics.com or see us at the Outdoor Retailer Summer Show, July 23 - 26, MR#204. Come explore our many performance fabric technologies and discover what our fabrics can do for you. Fox River Mills, founded in 1900, is the longest continuously-running hosiery mill in the U.S. The company became a division of SMC, a New Jersey-based domestic manufacturer of socks and hosiery, in 2016. Together, they manufacture socks for outdoor, snow, work, military, sport and everyday wear, as well as boutique luxury, novelty and team sport socks. To learn more, visit foxsox.com.